Olaf and Sven are about 2 years old and have come to us from the West Coast. 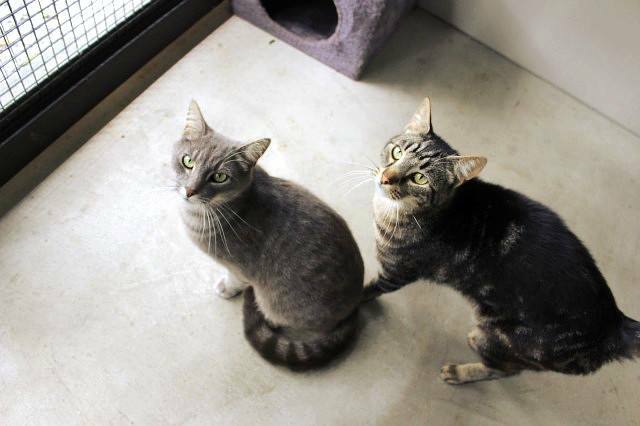 They were surrendered because they were spraying indoors – this was probably due to them being bullied by neighbourhood cats and we have had no problems here at the cattery. Olaf and Sven are brothers. They are both friendly, grey tabby Olaf is a cheeky dude while brown tabby Sven is cuddly but less confident. They are good with children and will suit a calm home in an area without lots of other cats. We would like them to be adopted as a pair.